Andy Pye investigates a brand new design of air compressor for use in contamination free environments. The total global market for industrial air compressors is expected to reach more than $17.5 billion (£14.3bn) by 2017, with compressed air accounting for 10 % of industrial electricity demand. Air compressors are used in all sectors, but there is a critical requirement for oil-free air in sterile environments including aerospace, medical theatres, dental surgeries, pharmaceutical labs and food production plants. Oil is the most efficient lubricant needed for compressors to operate at maximum efficiency; however, oil particles can contaminate the air produced. Alternatives are water injection or the dry-running screw. Water-injection has been used for decades in otherwise dry-running twin-screw compressors, for example as a wash (to clear particulate from the rotors) in applications such as lime-kiln gas and coke-oven gas recovery. More recently, water-injection has become regarded as an attractive alternative to dry-running, because compression with liquid injection is more energy efficient that dry, or adiabatic, compression. 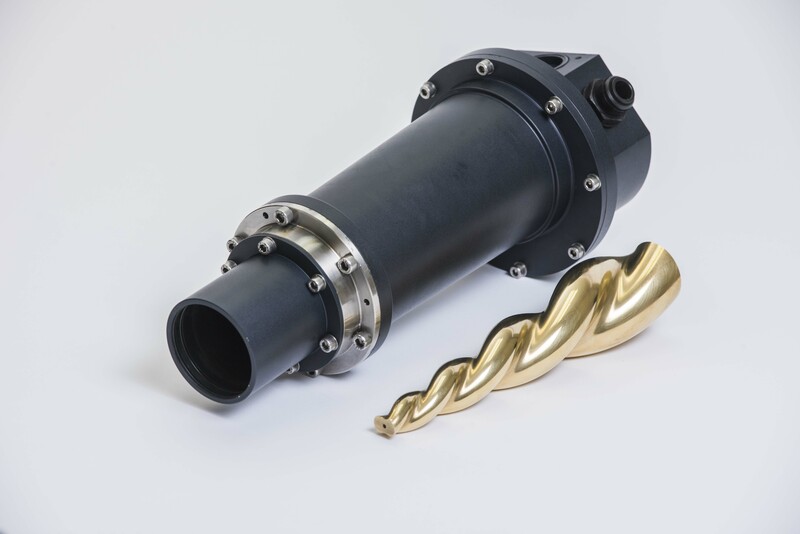 A water-injected screw is not noisy, and does not produce the uncomfortable high-pitch “screaming” noise, which is typical of dry-running screw compressors. * as a sound-damper both by absorbing some of the noise generated and also significantly lowering tip speeds and rotor passing frequencies. But a major difficulty has been that to operate with water, twin-screw compressors have to be re-engineered from corrosion-free materials – the screw rotors in twin-screw compressors are typically manufactured from carbon steel. Because of the costs involved with this, clean air compressors have always been large, needing their own plant room and expensive, inefficient connections. Now, Vert Rotors, a specialist in micro-compressor technology founded in 2013, has announced the launch of the Vert.80, the second product in a pioneering range of micro-compressors. Vert.80 is a powerful but very portable compressor for on-demand clean air. The machine is a water-injected portable compressor, half the size and said to be 34% more energy efficient than comparable machines. It produces 42% more oil free air for 13% more electric power. Vert’s proprietary technology is a rotary conical screw design which minimises noise and vibration while delivering massive energy and cost savings. It is the result of five years intense research and development. Being small and mobile, it solves the problem of getting oil-free air where and when it is needed. The conical rotary compressor is a new type of screw compressor. Screw compressors are known to produce high pressure without vibration, and at very high efficiency. However, up to now, only large screw compressors have been available (2kW and bigger). Vert’s new conical technology has changed that and opened a new market of small – even miniature – screw compressors that produce high pressure without vibration. In the Vert’s conical compressor, the Inner conical screw revolves inside the Outer conical screw. It defines a fundamental difference from traditional screw compressors, which include two screws sitting side-by-side in a housing. In the traditional twin-screw system (developed 80 years ago) the clearance between the two screws and the housing allows the high-pressure gas to leak back, and efficiency is reduced. In the conical rotary compressor, there is no housing, which makes it very difficult for high-pressure gas to escape. The compression chamber is formed by the volume trapped in between the Inner and the Outer rotors. In operation, a compressible gas is drawn into the assembly at the large end of the cone. The absence of the blowhole is perhaps the single most important difference between the conical screw and the more common twin-screw types. Leakage flow through the blowhole is the main cause of reduced efficiency in twin-screw compressors. Vert’s machine performs “progressive compression: first, a portion of gas is captured inside the compression chamber, and as both screws revolve, it travels from the suction (large) end of the cone to the discharge (small) end of the cone; the compression chamber reduces in volume and pressure increases. High-pressure gas discharges from the assembly at the small end of the cone. On the other hand, the rotors in the conical screw compressor are in continuous rolling and sliding contact, and friction can present a challenge. In the CRC.80, to improve endurance, materials are that form a low-friction pair. The female rotor is manufactured from a composite polymer material with PTFE (low-friction) characterised by very low absorption of water. The male rotor is produced from CZ121, brass which has good corrosion resistance. The conical rotors and bearings are enclosed in an aluminium housing. The price of stainless or composite bearings is quite high, and this increases the cost of the compressor. It should be noted however, that in batch production quantities, the additional cost of the bearings would only accounts for a few percent of the total bill of materials. The primary separator needs to be produced from stainless steel (which is also expensive), or cast from aluminium. Secondly, the long-term impact of sliding and rolling friction between the conical rotors in the water-injected compressor needs to be studied more, since water is a much weaker lubricant compared with machine oil. During trials, a number of composite materials were analysed, from the perspective of their friction properties and machinability. Some very promising materials, such as graphite-filled composites and nylons, were discarded because they either have poor machinability or deform due to high absorption of water. It was demonstrated that, with low-friction composite polymers modified with PTFE, as selected, the energy requirement of the machine could be reduced by as much as 30%. To achieve the exceptional tolerances demanded, Vert Rotors kept the full design and production cycle in-house at the company’s manufacturing plant in Edinburgh. From initial simulation and design, through CAD and CAM to production, testing, verification and improvement, Vert controls design and production on site. All parts are bespoke and manufactured using simultaneous machine milling on five axes and five planes with precision probe measurements taken at 400 touch points on a 40mm screw. Ultra precise milling of very complex shapes (not a square block) to super fine tolerances of 5 microns or less, preferably 2-3 microns is an extremely advanced technology. Vert Rotors performs 5-axis milling to highest tolerances as 3-5 microns for very complex shapes, such as the miniature conical screw. This capability is achieved with high-speed 5-axis CNC mills, advanced offline CAD-CAM software.